No one is ever going to complain about having one of these in their lunchbox, and they're pretty handy to have around in a kitchen for a quick, snatched burst of energy at any time. Heat the butter, chocolate and golden syrup in a heavy-based saucepan over a gentle heat. Remove from the heat, scoop out about 125ml/4½fl oz of the melted mixture and set aside in a bowl. Place the biscuits into a plastic freezer bag and crush them with a rolling pin until some have turned to crumbs but there are still pieces of biscuit remaining. 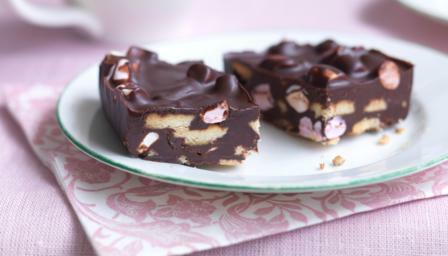 Fold the biscuit pieces and crumbs into the melted chocolate mixture in the saucepan, then add the marshmallows. Tip the mixture into a 24cm/9in square baking tin and smooth the top with a wet spatula. Pour over the reserved 125ml/4½fl oz of the melted chocolate mixture and smooth the top with a wet spatula. Refrigerate for about two hours or overnight. To serve, cut into 24 fingers and dust with icing sugar.